Since launching its first property along the Gold Coast in 2011, the QT brand has expanded at a dizzying rate adding Port Douglas, Falls Creek, Sydney and Canberra in quick succession. The group has just opened its second Sydney property, this time in louche Bondi. Predictably, the 69-room property – which is part of the larger and more ambitious Pacific Bondi development of retail, hotel and restaurants – is sunny, cheeky and laid-back all at once. Interior designer Nic Graham layers gelato pastels and timber detailing over an all-white background, while costume designer Janet Hine was responsible for the quirky staff uniforms and the Australian-born, London-based artist Shaun Gladwell has sprinkled the public spaces with digital artwork inspired by the Bondi landscape. 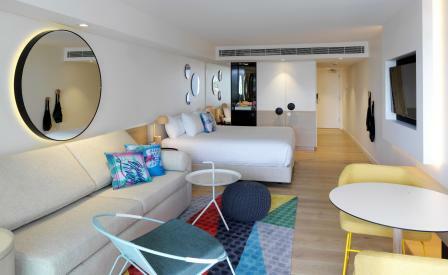 The rooms are spacious to a fault with most featuring kitchenettes, though for a hotel with an address on Beach Road, it’s a pity that most rooms face either the city or the atrium, leaving only the QT Gould Suite with what the promotional literature coyly refers to as ‘ocean glimpses’.